Welcome to Our Contemporary Tacoma, WA HotelYou will enjoy a comfortable stay at the Holiday Inn Express Hotel & Suites - Tacoma while in Washington because our hotel's location on I-5 provides you easy access to the McChord Air Force Base and a variety of attractions.Did you know that you can enjoy an array of attractions as our hotel's guest? The Tacoma Dome frequently features concerts and comedians and is only 10 minutes from our hotel's location. Tacoma also features unique attractions like the Museum of Glass and the Sprinker Rec Center and Ice Arena.We provide a convenient option for business and military travelers, as both the Fort Lewis and McChord AFB are found in Tacoma, WA. Our hotel is also minutes away from Pacific Lutheran University, Port of Tacoma, Tacoma Convention Center, True Blue Inc and U.S. Oil and Refining. Corporate visitors should be sure to check out our business center, which features copy and fax services.Whether business or pleasure brings you to Tacoma, Washington, our hotel's quality amenities and services will satisfy your needs. With our free high-speed, wireless Internet access, you won't miss any important emails. 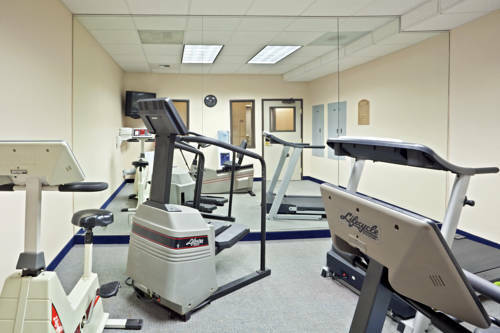 Our indoor pool, sauna and 24-hour fitness center provide the perfect escape at the end of a long day. Wake up and enjoy one of our hot, signature cinnamon rolls served each morning at our Express Start breakfast bar. We look forward to your upcoming visit! Tacoma MallIndoor mall featuring 150 stores including Nordstroms and Macys. Chambers Bay Golf CourseHome of the 2015 US Open! Voted the #1 public golf course in Washington State. Chambers Bay is a full service golf course comprised of more than 950 acres located along the shores of the Puget Sound in University Place just a short drive from the hotel.